Over the last six months, the Workers’ Action Centre has been organizing to get the word out about new workers’ rights in Ontario. And there is more to come! A $15 minimum wage and fairer scheduling legislation is coming to workplaces on January 1, 2019! But these victories could easily be lost if we don’t ensure they are defended. On June 7, let’s vote to protect these hard-won gains! Every vote for $15 and Fairness counts, so please support a candidate who respects and supports fair wages and working conditions for Ontario. Outreach has been relentless across the province, letting workers know where the political parties stand on the $15 minimum wage and decent work. People are concerned because they know how important decent working conditions are for their health and families. We’ve mobilized hundreds of workers who want to protect our new rights. Workers’ Action Centre members and our allies in the Fight for $15 and Fairness are working non-stop to get this message out: Ontario’s labour laws will only be as strong as our decent work movement! 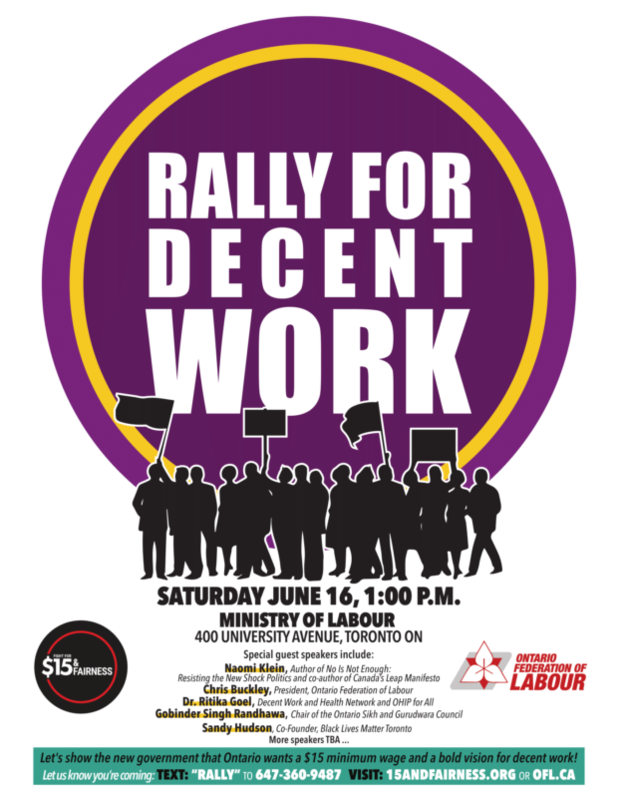 Be a part of the movement by signing up for the Rally for Decent Work on Saturday, June 16. It will be unforgettable with great speakers, such as author, filmmaker, and social activist Naomi Klein. Click here to share workers’ rights info on Facebook. Click here to share workers’ rights info on Twitter. Also, please help us make sure workers know their new rights. 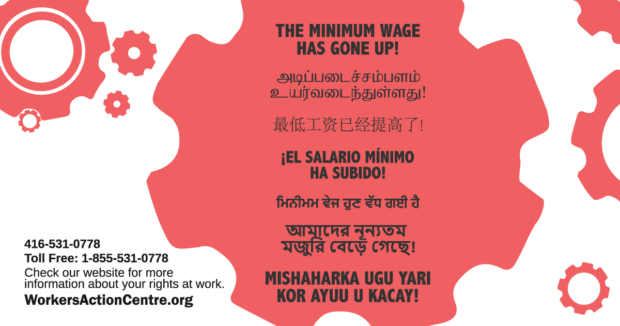 Share our minimum wage postcards on Facebook and Twitter. You can also download and print resources for workers in your community, or share this post with your friends. These rights that we’ve fought years to achieve are all at stake during this election and beyond! Join us at these upcoming actions to help defend the $15 minimum wage, fairer scheduling rules, and other new labour law protections. Thank you for staying involved in the fight for decent work. We’ll see you at the polls, and then we’ll see you at the June 16 Rally for Decent Work!